The majority of styli are now no longer available as original equipment and unless stated 'Original', the replacement styli supplied are precision manufactured in Switzerland or Japan to high quality standards that ensure performance closely matches original as detailed. Many of these styli were fitted to universal cartridge types commonly used by various manufacturers of turntables and record players. 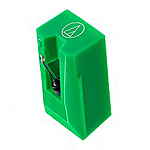 Stylus part numbers and colours described are original and these may vary on supply according to supplier package labelling and manufacturer rationalisation for limited production runs. 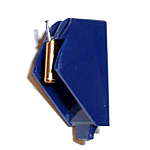 The styli shown are only suitable for the Original cartridge fitted by the manufacturer of the player and not if the cartridge has been replaced. Please check that the stylus shape shown is the same as the one fitted, although the colour of the plastic may be different. If in doubt then please submit a photo of the stylus required for identification. When buying cartridges at the special Exchange price for delivery in the UK the exchange item must be returned within 7 days, for EU 14 days of receipt of the new cartridge ordered. If the exchange items are not received within 14 days then we will contact you again to clarify your intentions with a view to charging the difference in price against your credit or debit card. Proof of postage should be obtained for exchange returns to Mantra Audio.